Since Windows 95, there is a registry entry “MenuShowDelay” where you can make the Start menu expands automatically and instantly when the cursor is on the menu. During my teenage years when I was working part time at a computer shop building desktops, my boss made sure that I added this registry entry to every computer that is being sold so that it seems to work faster. In today’s Windows 7, the MenuShowDelay registry entry still works on most programs that has the normal menu bar, but definitely not on the Start menu since Windows 7 no longer comes with the classic Start menu. There are normally 3 types of users. The first one is they want everything to be fast and don’t need the unnecessary eye candy animations. Second one is they don’t care about it and the third one is they find it hard to keep up with the controls. As good as I am in controlling Windows using the keyboard more often than the mouse, I actually find it hard to type using the on-screen keyboard in my android smartphone. Anyway, if you find it hard to navigate around with the menus and submenus because it automatically expands after hovering the cursor on it, you should set it only open the submenus via mouse click. In fact, I even find myself clicking on the menus itself to expand the submenu because the two seconds pause to auto expand seems to be a little too long for me. 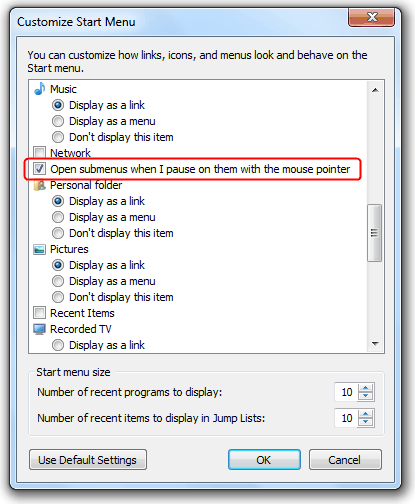 In Windows 7, there is a setting that can disable the auto opening of submenus when you pause on them with the mouse pointer. Right click on the Taskbar and select Properties. Go to Start Menu tab and click the Customize button. Scroll down and somewhere in the middle you will find an option that says “Open submenus when I pause on them with the mouse pointer“. Uncheck it and click OK. Now submenus at the Start Menu will no longer automatically expand until you click on them. If you use Tuneup Utilities, you should find an option to specify how long before a submenu automatically opens when you hover over it with the cursor in Firefox. 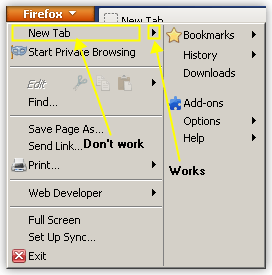 Once you select the Open menus only via mouse click option, the submenus at Firefox will only be expanded when it is clicked. Basically the ui.submenuDelay is an independent setting for the Firefox menu speed. If ui.submenuDelay is missing, Firefox automatically refers to the MenuShowDelay speed. The MenuShowDelay can be configured at HKEY_CURRENT_USER\Control Panel\Desktop\ in Windows Registry. If you set MenuShowDelay to 0, the submenu will be opened instantly. To delay or configure the submenu to open on mouse click, set the value to a really high number such as 65535. The MenuShowDelay also works on Opera, Internet Explorer and Safari but not on Google Chrome. 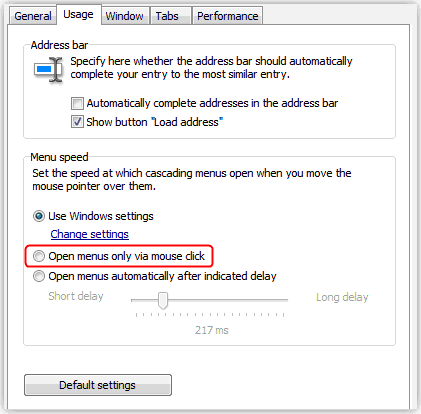 As for Firefox, do take note that the ui.submenuDelay or MenuShowDelay will only work if the mouse cursor is on the “expand arrow button” when Firefox is on a single button menu. If you enable the menu bar by right clicking on empty section of the Tab Strip and check Menu Bar in the pop-up menu, then it works on all menu. By any chance can we edit the menu items as well? i.e. options which comes when we right click on a page like SELECT ALL, VIEW PAGE SOURCE. I guess there are some software which can do some sort of trick; but is it possible to do something in the Firefox setting itself? You can customize the right click menu items but with a limit. Here are some information on how you can do that. There is an add-on called Menu Editor where you can use it to remove or rearrange the menu items but cannot add new items.